Here is another great project from the #SBIDinspire series featuring finalists from the SBID Awards that showcase our talented members and subscribers. SBID interviews the imaginative minds behind the projects to give an insight into their creative process and how they tackled some of the industry’s biggest and best projects. 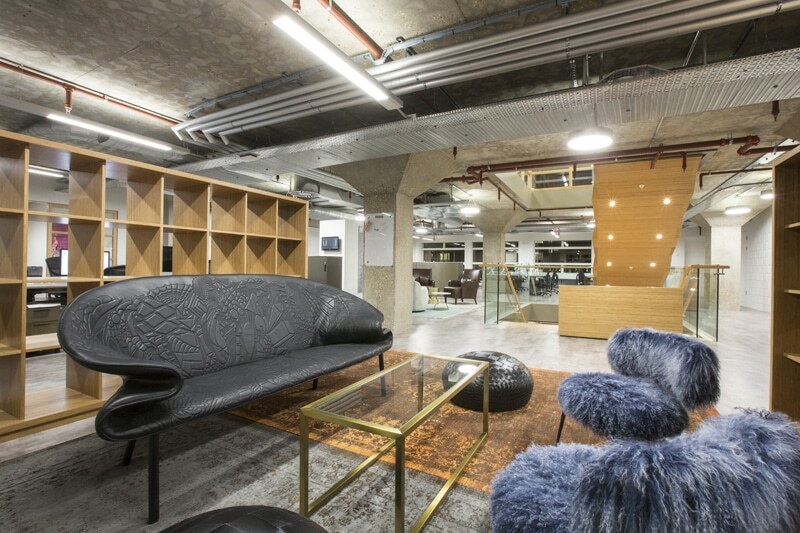 Our brief was to create a global design language for the pioneering fashion brand Farfetch, which could be rolled out beyond their London HQ to create a series of beautifully branded spaces globally (New York, Moscow, LA, Hong Kong, Shanghai…). 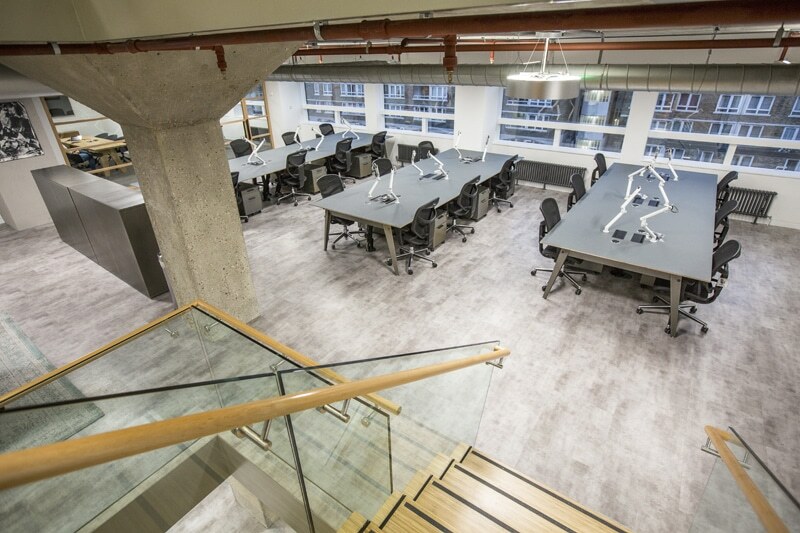 We had to deliver a series of optimal working environments that felt far removed from a traditional office and brought the formerly 2d Farfetch brand to life in 3d bricks and mortar. We had to weave the brand’s identity into an interiors narrative and a collection of bespoke furniture pieces which injected the Farfetch DNA into the shell of the existing international buildings. 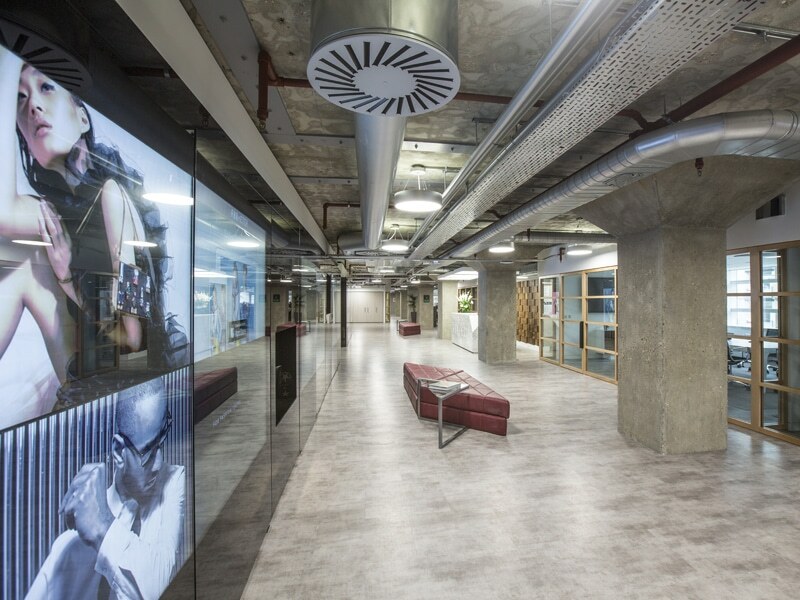 Farfetch’s combination of luxury fashion and technology led us to an approach that was more ‘installation’ than fit out, the result being a stylishly deconstructed and highly flexible gallery-style space. Our bespoke design scheme was inspired by the incredible diversity of the 400 global luxury boutiques brought together by Farfetch at one address. Farfetch has a ‘lead don’t’ follow’ ethos, being about individual style. We wanted to echo this throughout the design narrative. 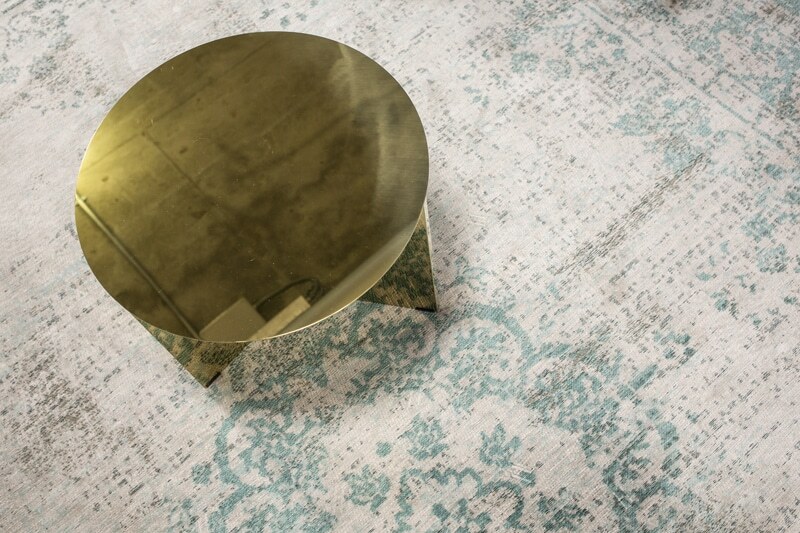 A luxury feel unites all the spaces, but each has its own identity. Curation is a key part of the service offered by Farfetch. With this in mind, we researched an eclectic group of global suppliers. 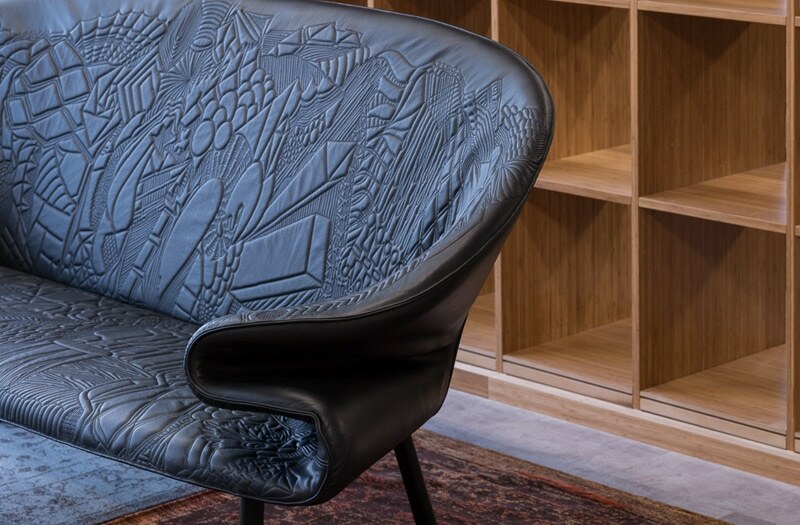 The mix of curated pieces, presented alongside the bespoke furniture designed and crafted by Studiofibre for Farfetch, ensures that the interiors scheme is as unique, eclectic, stylish and international as each of the boutiques represented by Farfetch. In order to bring every element of Farfetch’s identity to life, Studiofibre drew on the unique ‘sliced’ effect features in the letters of the brand’s distinctive logo. 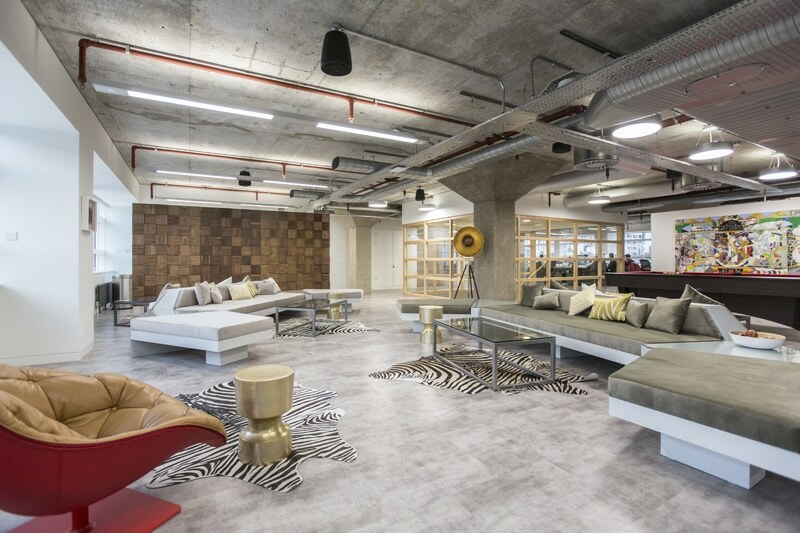 Bespoke furniture and other details around the office feature custom-crafted ‘sliced’ chamfered details which echo the unique and graphic Farfetch typeface. 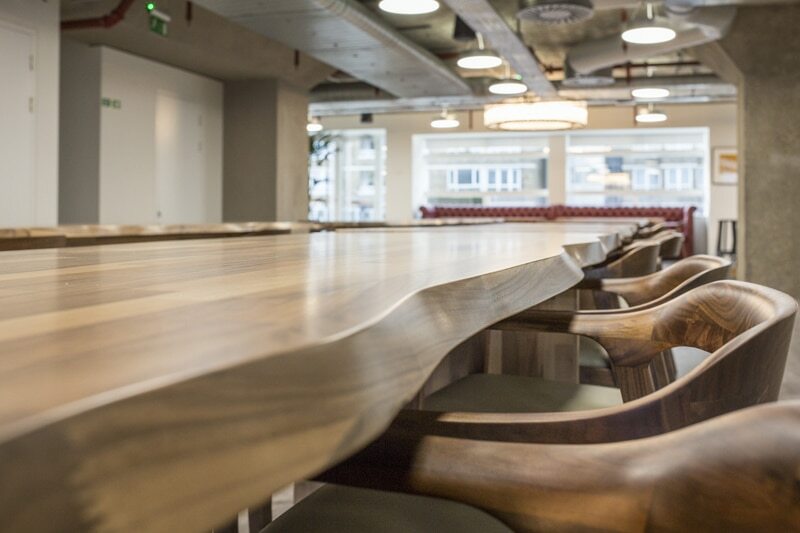 From the reception desk, to the door handles and the boardroom table to the staircase and even the customised desks, every detail elegantly animates the brand throughout the international spaces. Working with a fast-growing digital company always requires flexibility between design concept and project completion. 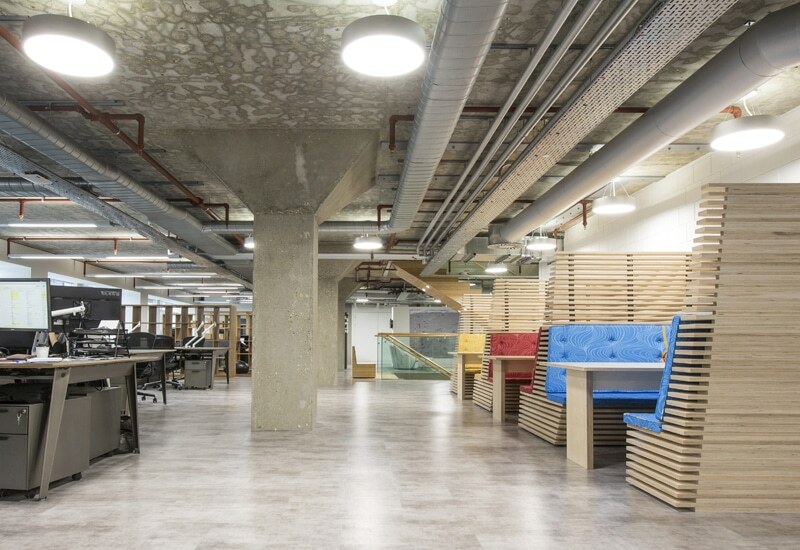 Midway through this project in London, Farfetch decided to take an additional floor in the building to accommodate their growing headcount. This move increased the square footage by a third, and meant that the space originally allocated to amenities (restaurant areas etc) had to be increased to accommodate more people. 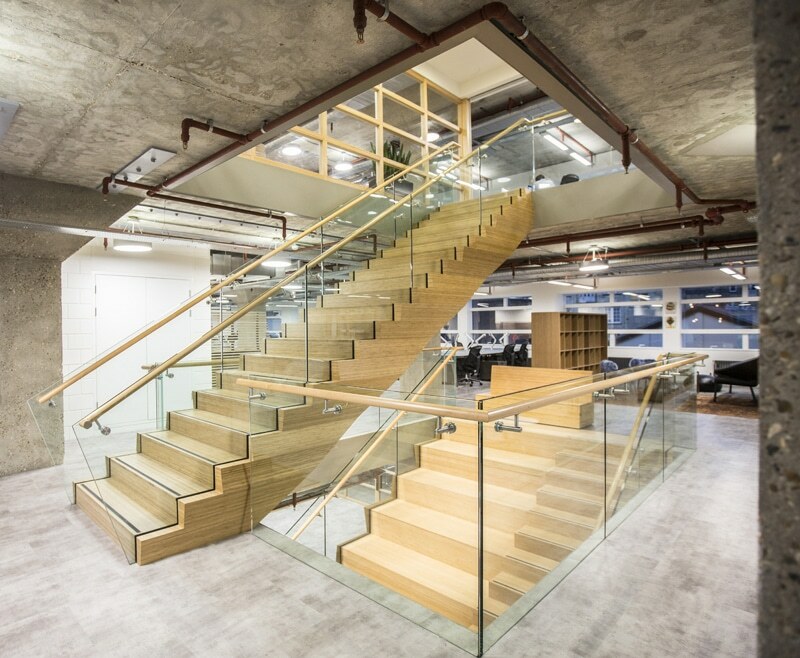 A particular challenge within the London HQ for Farfetch was the bamboo wood theatre staircase we designed and installed to create internal access between the three floors that Farfetch have within the building. The floors were previously not connected other than by a communal staircase running between all floors of the building. 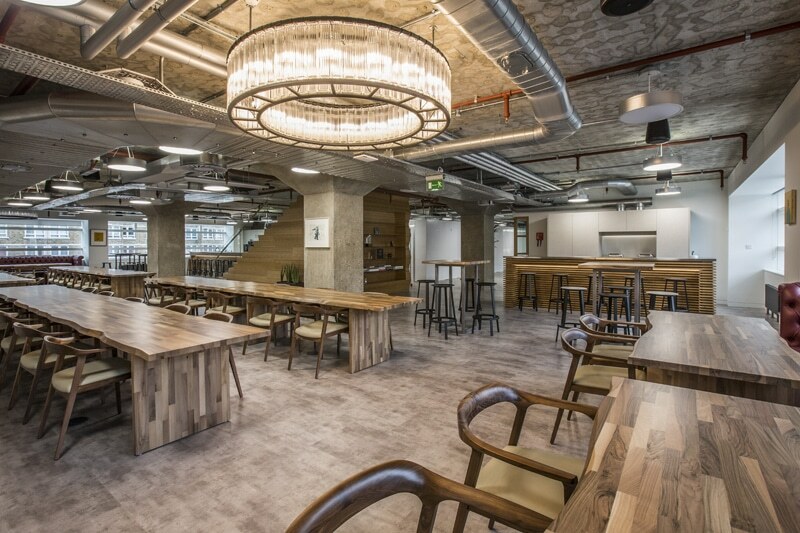 We wanted to create a focal point for each floor, uniting the various teams of the company and giving them a multi-use theatre-style staircase for company-wide gatherings. 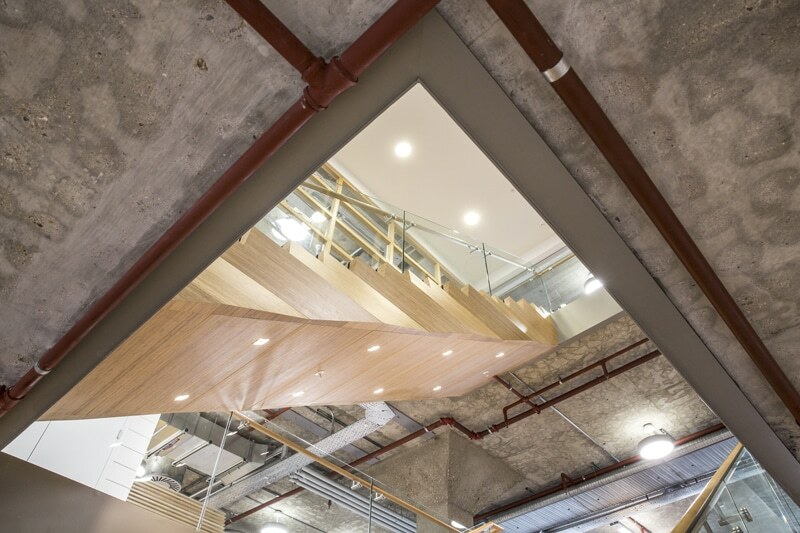 We therefore had to break through the ceilings, and architecturally this was quite an involved process, given the internal supporting structure of the building. However, the result more than justifies all the hard work required to get it right! 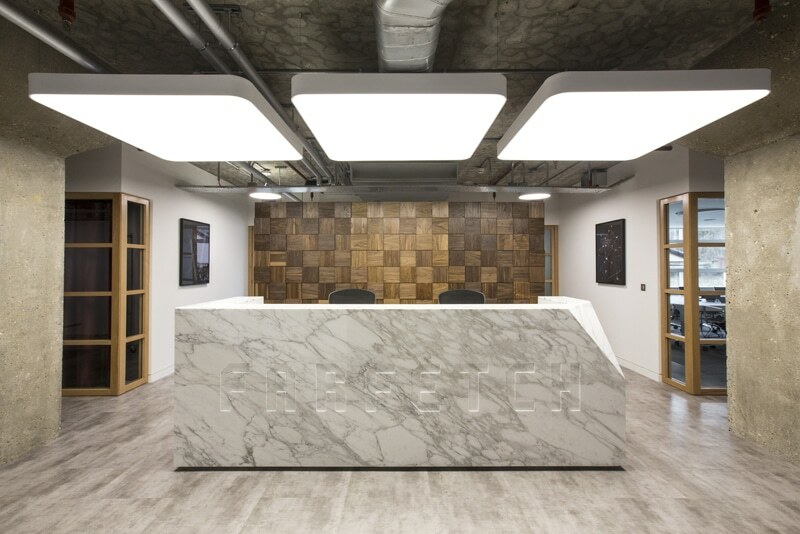 We always try and inject humour into our design schemes and the walnut ‘pixel’ screen paneling we designed and made for Farfetch draws inspiration from the idea of the square pixels that make up any digital image. Farfetch is where digital technology meets luxury. 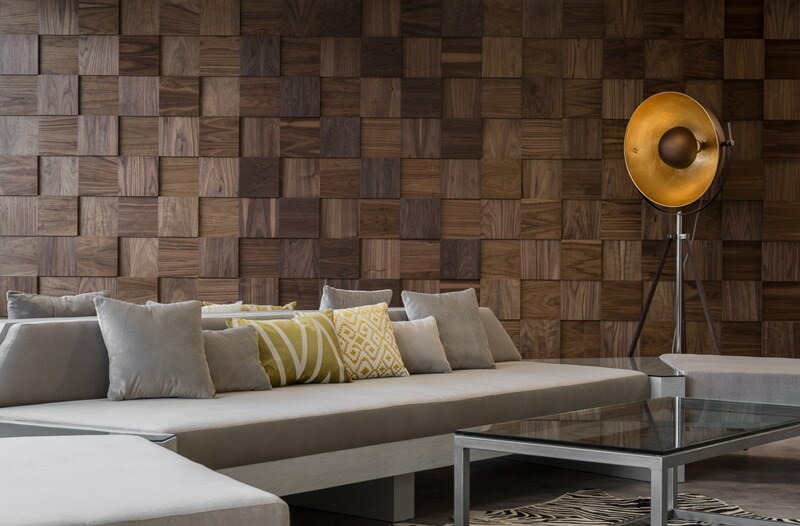 The oversized ‘pixels’ of this screen represent the technology, where as the high quality walnut wood that the ‘pixels’ are carved from represents the luxury. 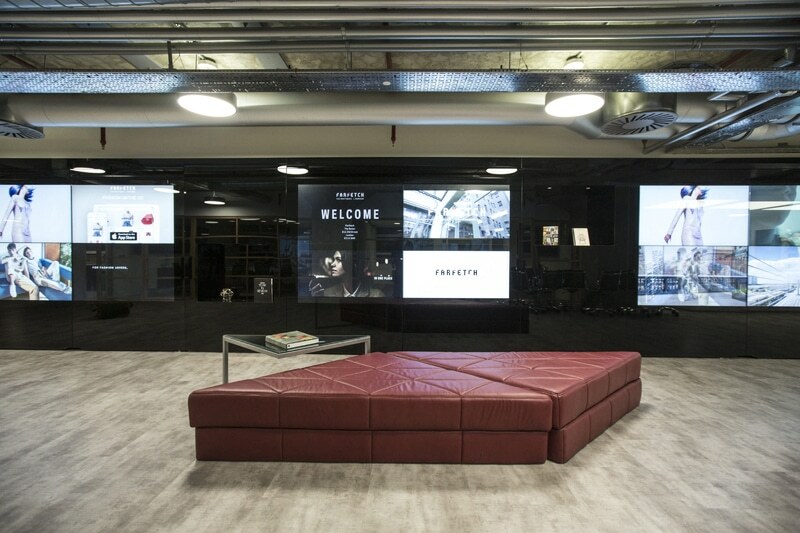 The screens have become an iconic backdrop for Farfetch, as the senior management team are often photographed in front of them for media articles and social media posts. 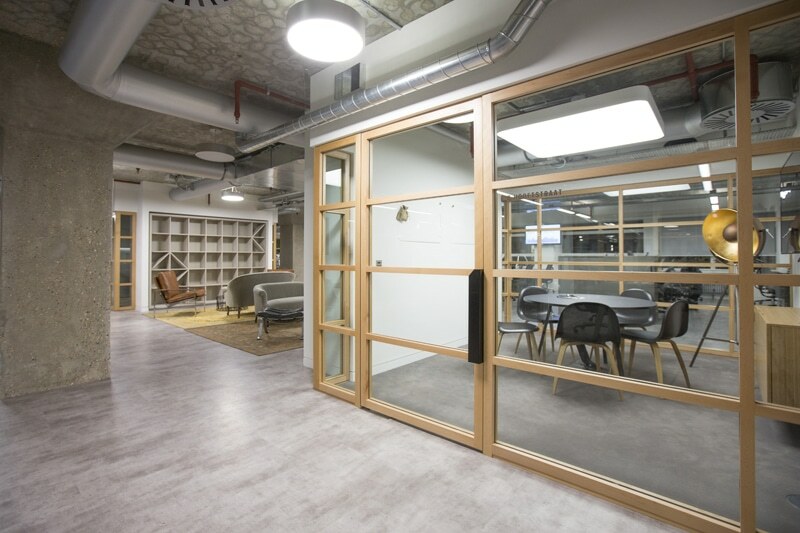 These screens (found in the reception and studio lounge areas of the London HQ) also have a practical use. 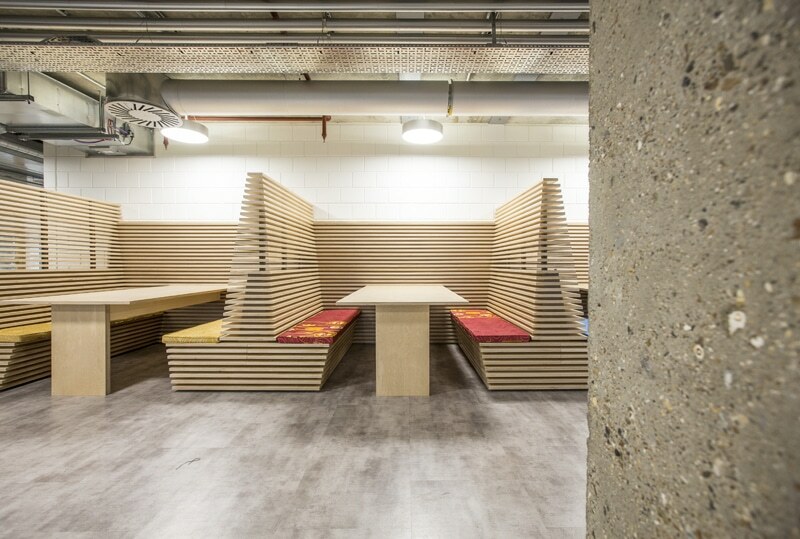 They screen-off a tea-point in the studio lounge and a post sorting area behind reception. This ‘pixel’ walnut design is also used on cabinets in the four board rooms which neatly contain all the technology required in each room. Another highlight is the Live Wall. Upon entering any of the Farfetch spaces, the visitor begins a journey into the Farfetch brand. The first experience is the conceptual ‘omnichannel’ high-tech live AV Wall, a vast wall of both physical and virtual elements, featuring curated video content and still life images alongside physical display. As it constantly evolves, the vibrant AV Wall embodies the Farfetch brand identity. We entered the SBID awards as we felt that formal recognition of the success of our work would benefit our business, and be a powerful endorsement for both us and Farfetch. We are delighted to have been shortlisted in 2016! 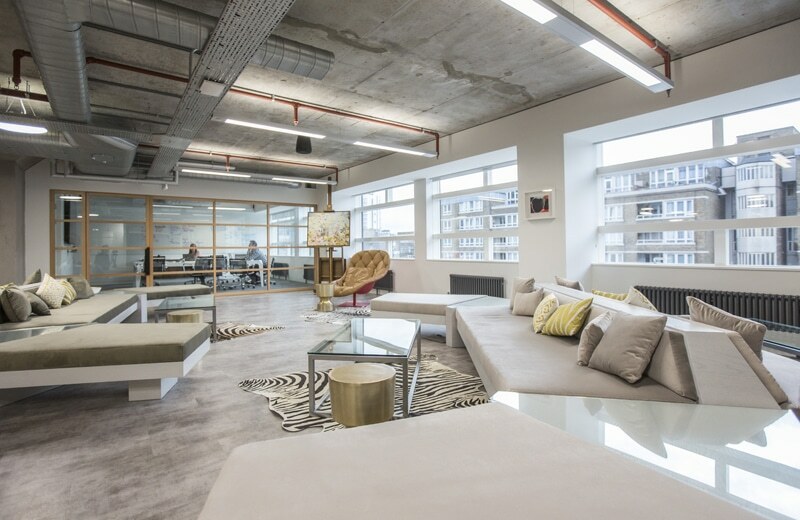 Questions answered by Fiona Livingston, the Founder and Director of Studiofibre.